In this lesson, we will learn how to calculate the change in the potential difference and current produced by a transformer. 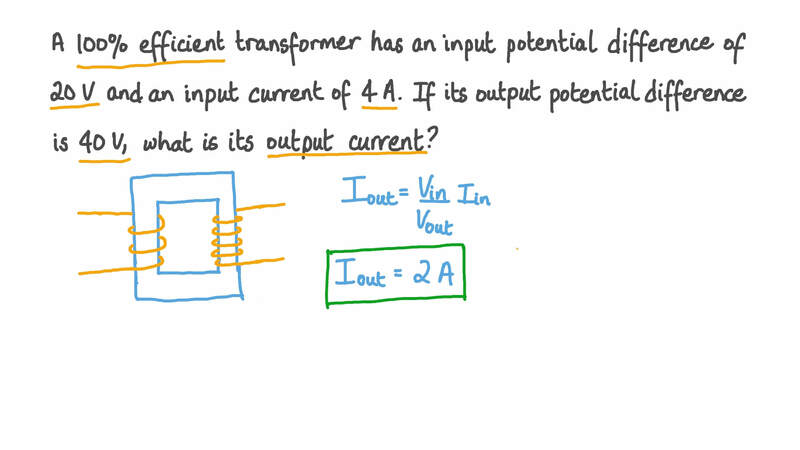 A 1 0 0 % efficient transformer has an input potential difference of 20 V and an input current of 4 A. If its output potential difference is 40 V, what is its output current? A transformer has 300 turns on its primary coil and 150 turns on its secondary coil. 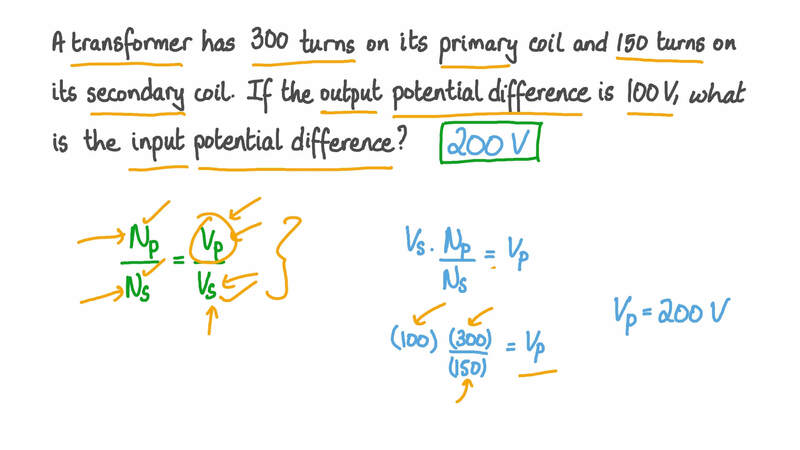 If the output potential difference is 100 V, what is the input potential difference? A 1 0 0 % efficient step-down transformer has 100 turns on its primary coil and 20 turns on its secondary coil. The input potential difference is 250 V and the input power is 7 5 0 0 W. What is the output current? Which of the following is a suitable material for the core of a transformer? A transformer has 200 turns on its primary coil and 50 turns on its secondary coil. If the input potential difference is 20 V, what is the output potential difference? A step-up transformer has turns on its secondary coil than on its primary coil, and, thus, a potential difference across the secondary coil than across the primary coil. A 100% efficient transformer has 5 times as many turns on its secondary coil as it does on its primary. If the current through the primary coil is 20 A, what is the current through the secondary coil? A step-down transformer changes the potential difference of an alternating current from 1 0 0 0 0 V to 250 V. If it has 25 turns on its secondary coil, how many turns does it have on its primary coil? 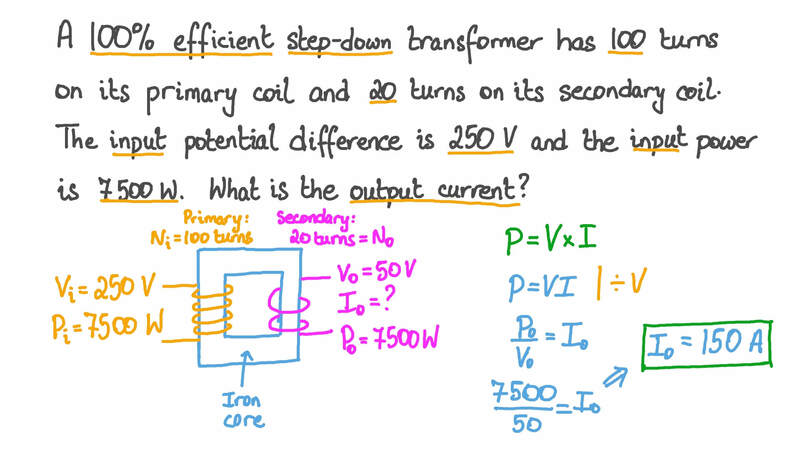 A step-up transformer needs to change the potential difference of an alternating current from 50 V to 250 V. If the transformer has 100 turns on its primary coil, how many turns does it need to have on its secondary coil? A step-up transformer has 8 times as many turns on its secondary coil as it does on its primary coil. If its input potential difference is 40 V, what is its output potential difference? What kind of current are transformers used with? Which of the following electrical properties are changed by a 1 0 0 % efficient transformer?